Details of when, where & what for our guided bike tours of Portugal. Please contact us if you want to advance book/request particular tours. We can also put together a limited number of custom tours for anyone wanting a tailor-made trip for a closed group. Over the last six years, Pedal Portugal has become the number one information source for cyclists interested in this gem of a destination. After years providing advice for other riders, I began running my own biking tours of Portugal in 2016. Scroll down for more details of individual tours. Pedal Portugal’s guided cycling holidays involve my wife and I taking small groups (maximum 10 people) on bike tours through some of our favourite parts of this great country. We’ll help you discover back roads most tourists never see and show you some of the country’s best scenery and sights. Along the way, you’ll stay in a range of places – from rustic to swish – and eat at restaurants where you can sample a wide range of typical Portuguese dishes. “Huw and Carolyn did a truly wonderful job shepherding us through Southern Portugal. Click on the Reviews page to see what previous riders thought of our cycle tours. You can see pictures from previous tours on the Pedal Portugal Facebook page. You might also want to look at the blog for other bits and pieces about our bicycling experiences! The aim of all my tours is always to enjoy the ride – the scenery, the sights along the way, the people, the cakes and wine, etc. After all, it’s a cycling holiday not a competition! We won’t be racing, we’ll be taking in the view, with no deadline to get from one place to another. The biking is important but the idea will be to see some of the best parts of Portugal from a bicycle saddle, not clocking up kilometres just for the sake of it. However, it is important riders are capable of riding the distances shown for each tour and cycling on consecutive days. The idea is also to make the tour a sociable experience, riding in a group and hopefully making new friends along the way – and discussing the day’s ride over dinner and a glass of wine or two. Breakfast and evening meals* are included in the price. Picnic lunches are also included on the main riding days as this helps us be flexible and have lunch when and where it suits us. *Vegetarian and other special diet options are possible but please seek our advice when booking. The Algarve Coast & Country takes in some of the most scenic scenery of Europe’s south-west corner, including spectacular Cabo São Vicente. The prices of these cycling holidays are based on staying in a selection of small hotels and guest houses, eating in decent but not Michelin-starred restaurants. Please see each tour page for individual prices, more information about distances, meals and what you will see along the way. Please see the individual tour description for further details of what is included for each tour. 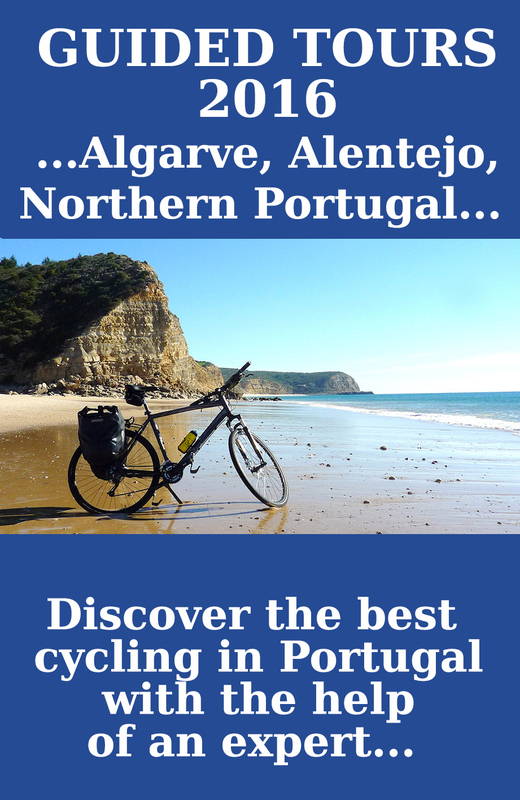 We work with Cycling Rentals, a company based near Lisbon but able to deliver anywhere in Portugal. This cost is extra and you will be responsible for any bicycles hired – although riders on our tours get a 15% discount on the company’s normal prices. You will also be responsible for all personal insurance, medical cover etc. Please see our full terms and conditions before making any booking. We’ve both been long-term supporters of the disaster relief organisation ShelterBox and we donate £15 to the charity for every rider who joins one of our tours. If you have general or specific questions, please free to email pedalportugal@gmail.com. You can also join our mailing list using the form below if you want to be kept informed about future biking tours, dates, availability etc..